drumMUSTER provides an easy, environmentally-friendly way of disposing of empty farming chemical containers across rural Australia. With the approval of drumMUSTER, TP Jones have developed a unique service & to increase the collection of empty containers from their clients, they have manufactured cages specifically for the collection of drumMUSTER qualifying drums. These cages have been dropped on properties in Tasmania for farmers to put their triple-rinsed drums in once used. Once the cages are full the TP Jones trucks will collect them and take the empty drums to local drumMUSTER sites. TP Jones General Manager Rafe Bell is one of the initiators of the program. “With an ever-increasing volume of chemicals being used on farms, TP Jones believe that it is all our responsibility to deal with the disposal of these empty drums. Whilst this will be a fantastic service to our clients, it is also a moral decision to be part of the solution rather than part of the problem. We plan to produce eight of these cages initially and then if successful, produce more”. 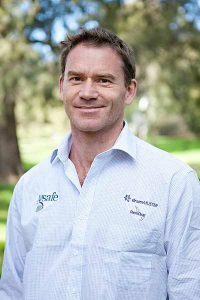 At the time of writing, five cages are currently on Tasmanian farms, and seven more cages have been ordered due to increased demand. Locations for the cages are Longford, Bishopsbourne, Cressy (two cages) and Penguin. Farmer Stewart Mcgee is part of the program and has a cage on his property in Bishopsbourne, south of Launceston. Stewart said that he was more than happy to support the program. “The cages are easy to use, easy to get in and out, they handle the drums well and it removes the problem of storing empty drums in the sheds or other areas on the farm” Stewart went on to praise TP Jones and drumMUSTER , as well as all the other contributing organisations for their commitment to this initiative and for the supply of the cage. Andrew Winkler (pictured) is a Regional Consultant for drumMUSTER and has seen the program go from idea to reality. “This is an exciting initiative and a positive development in agricultural waste management. 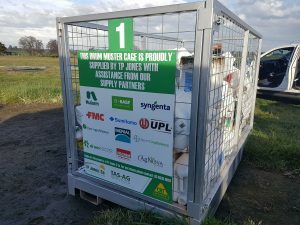 TP Jones should be applauded for this progressive service that not only benefits local farmers but also the drumMUSTER recycling program and the broader environmental landscape”. Throughout the 20 years that the drumMUSTER program has been in operation, over 31 million chemical containers have been collected and recycled. That means 31 million containers saved from landfill, or from being buried or burnt on farms. The recycled drums are turned into farm fencing pickets, wheelie bins, and again into chemical containers. 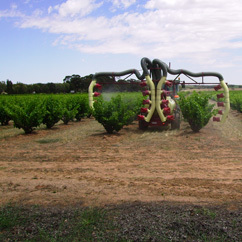 Disposing of empty agvet chemical containers in the right way is crucial to the reputation and sustainability of the agricultural industry in Australia. By using the drumMUSTER recycling program you can turn your unwanted containers into useful, sustainable products rather than having them placed into landfill or piling up on the farm.